Look at what I did today... Wall mounted my wall mount. Holy crap! CPUs and monitors everywhere!?! It looks like you coiled the transatlantic telegraph line around your computers. Do you have to stand up to use the wall mounted computer. Where do you put your legs when sitting at the desk - with all those PCs under it? I added a desk, got more pcs, and I'm adding the same desk to the left and a vertical dual monitor mount for the two large monitors. JEEZ!! What is the point of all that stuff?? I could maybe see the usability of a dual monitor system and a mac... but all that is a little somethin' i like to call overkill. 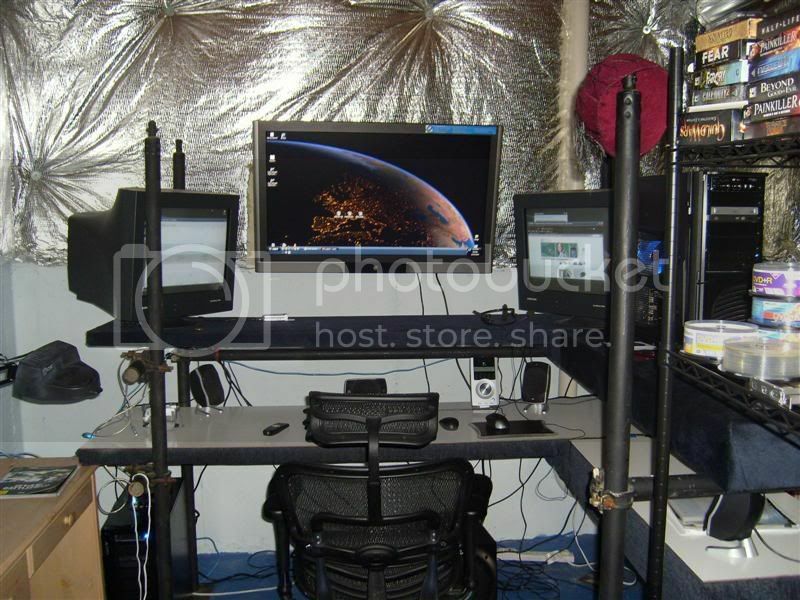 I would set up LAN parties, personally. and you haven't answered ha: where do you put your legs?? If you are talking heat, I don't game in the area, I have a core i7 non overclocked in an antec 900, a 5770, and a bunch of lcds. The lcds that emit alot of heat have fans behind them. You don't notice any heat. The only thing that's overkill is the imac, which I got for $50 to make iphone apps with. The main pc I use all the time and the wall device is a file server, which is also used alot for backups. It's on the wall due to the only time I use the keyboard is to update linux. And you don't really put your legs under the desk. I'm in the process of finding a better desk. I would build a custom desk. I think most desk are designed for women or children. I can't fit under any I tried with a keyboard drawer. Nice pics. Myfist, I have the same problem as you. I actually custom built a desk out of scaffolding materials that I painted, then added 2x4's, plywood and a fabric top. Over the fabric i snagged a sheet of shower wallboard from Home Depot (it's very similar to white dry erase board) and put that on top. It worked out great. My wife didn't love the industrial look though so when i had my basement finished I was planning on having my contractor build a desk to my specs. 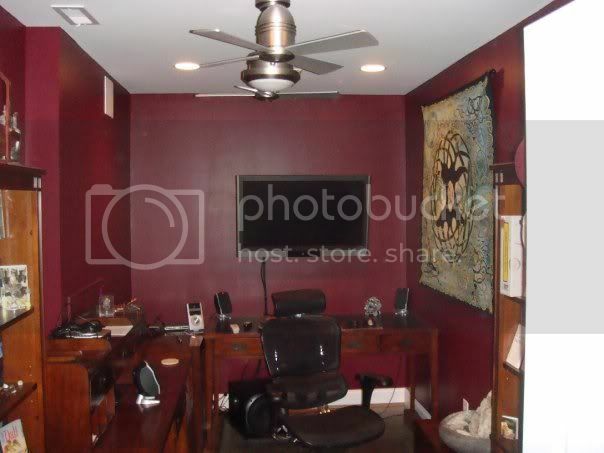 He wanted to charge too much money ($3k) so i went out and looked for a 'real' desk. I couldn't find one that was high enough so I found a nice one that had a keyboard drawer that was removeable. I ended up leaving the keyboard drawer in though and got a 4x4 that i cut in half, stained, then bored a shallow divit in so the legs wouldn't slide off easily. This worked Great! Yor 1st 1 is perfect for the bachelors. You might have tried adding a frilly table cloth and a flower to keep the boss happy. Albert Einstien locked his basemend door. We men used to at least have the basement,garage and doghouse, but now all we get to ourselves is memories. I can see this thread going off coarse from here. wtb ur office chair Jon.. where'd u get it?! I've been meaning to get a new one.. currently I have a flowery rocking chair from my grandma that fits with my desk lol. Manfist, she added the fabric lol. i just had the bare wood with the white board. Oh i've told her to leave my man cave on a few occassions. It's also the 1 place in the house where she's not allowed to throw whatever junk of the day she has. (She lives crap everywhere and is worse than my 2 kids who are under 4 yrs old lol). And yes, the door has a lock, i damn well made sure of that lol. I highly recommend that chair. I work for an architectural firm so my fatass is in a chair most of the day (hell the firt 4 years i worked there i put in 60-80 avgs in just 5 days). I got a pair of these chairs (one for home and one for office) some years ago. My company is so damn cheap they just order the cheapest chairs they can find. Typically around $50 from some online etailer. They're like sitting on plywood. They got fancy once and ordered some $60 chairs for the conference room. There are some pretty darn well tried and tested rules relating to office ergonomics and anthropomorphics which need to be adhered-to when it comes to monitor position relative to eye-line. Typically the center of the screen needs to be slightly below your natural seated eye level. Raising it will cause neck pain which will manifest itself even as far as arm/wrist RSI. Actually you were 100% on that screen info.